Frontier Airlines at the mid point of 2015 seems to be closing in on the final stages of its transition to an ultra low-cost airline. It has bolstered its Airbus narrowbody orderbook and detailed plans to densify its fleet as it works to achieve the necessary cost base to brandish the ULCC label. The airline also continues to make tweaks to its network, making an unsurprising move in dropping service from Delaware’s New Castle airport, instead building up service at Philadelphia International airport. Frontier also appears to be dropping some routes from Atlanta and Washington Dulles, two markets where it has made a push during the last couple of years. 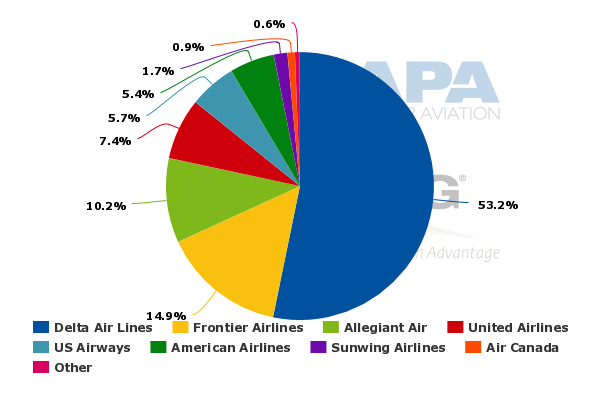 Company executives have previously stated that Frontier was profitable in 2014. Now as its unit costs move closer to the ULCC benchmark, prospects look positive that the airline will post a second consecutive profit in 2015. After being acquired by ULCC specialist Indigo Partners in late 2014, Frontier began its ULCC transition, which included naming former Spirit executive Barry Biffle as its president. CEO David Siegel resigned in May-2015. Prior to his departure, Mr Siegel told The Denver Business Journal that Frontier posted a profit in 2014, aimed to boost revenues by 15% in 2015 and reverse certain concessions employee groups have agreed to in the past in order to survive. As it works to meet it revenue targets, Frontier has also expanded its Airbus orderbook to 101 aircraft after ordering 10 A321 and two A320 current engine option aircraft as it works to start replacing its smaller 35 Airbus A319 narrowbodies. Orders include those placed directly by the operator and by lessors assigned to the operator, from 2-Jul-2015 onwards. But even as it works to replace some A319s, Frontier is also planning to increase seat density on its existing fleet. Mr Biffle explained to The Denver Business Journal that it would increase the number of seats of its A319s from 138 to 158, and on the A320s from 168 to 180. The new A321s will feature 230 seats. The new seat configurations appear to be more dense the Airbus narrowbodies operated by Frontier’s fellow ULCC Spirit, which has a fleet of A319s, A320s and A321s. Its A319s are configured with 145 seats, while its A320s feature a 178 seat configuration. Its A321s have 218 seats. Adding seats on Frontier’s aircraft is one way to meet the important USD6 cent ex fuel unit cost metric set by Indigo managing director Bill Franke. He told attendees at the CAPA Americas Summit in Apr-2015 that the key to successful execution of a low cost model was reaching the USD6 cent unit cost target. At the time Indigo acquired Frontier its unit costs excluding fuel were roughly USD7.7 cents. Spirit’s unit costs excluding fuel and special items for 1Q2015 were USD5.72 cents. Mr Franke stated that Frontier had made much progress in its ULCC transition, but there was still work to be done. Frontier also appears to be making some network tweaks as it adopts the ULCC model that basically entails operating in larger metro markets dominated by legacy airlines with just enough flights to stimulate a traffic base that is priced out of air travel. The airline recently ceased operations from New Castle airport in Wilmington, Delaware, which is roughly 52km from Philadelphia. Service as New Castle was a vestige of Frontier’s strategy prior to the ULCC transition that entailed service from secondary airports. Frontier resumed flights to Philadelphia in late 2014, which essentially spelled the end of service at New Castle. The airline has also built up a focus city in Trenton, New Jersey, roughly 58km from Philadelphia. For now it seems as if Frontier is keeping its operations in Trenton intact. 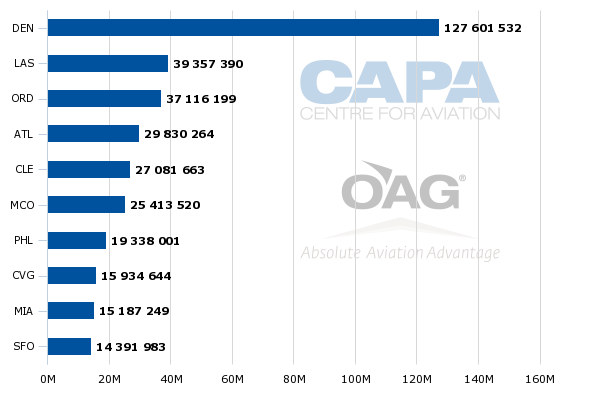 Data from CAPA and OAG for the week of 6-Jul-2015 to 12-Jul-2015 show that Frontier is operating flights from Trenton to Atlanta, Charlotte, Detroit, Fort Lauderdale, Minneapolis, Raleigh-Durham, Fort Myers, Tampa, Orlando and Chicago O’Hare. The overlapping markets that Frontier serves from Trenton and Philadelphia include Atlanta, Charlotte, Minneapolis, Orlando and Chicago O’Hare. Additionally, Frontier serves Cancun, Houston Intercontinental, Miami and Punta Cana from Philadelphia. 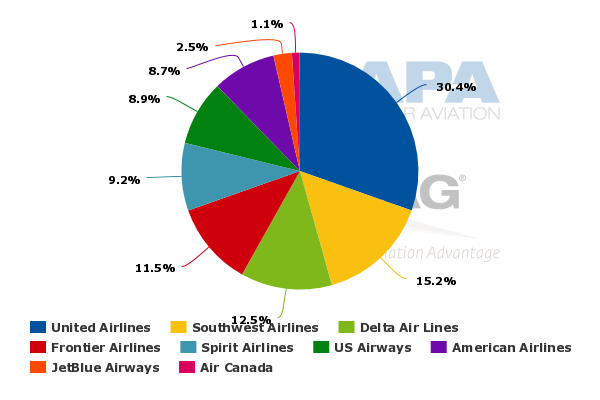 Frontier over the last year along with Spirit has made a push from Delta’s stronghold in Atlanta. Schedules in OAG show that the airline is ending service in Oct-2015 to Cincinnati, Indianapolis and Minneapolis from Atlanta. It is not clear if the eliminations are seasonal, or if Frontier is opting to examine other routes in the US domestic network. The airline still has ample service from Atlanta, operating service to Austin, Washington Dulles, Miami, Denver, Chicago O’Hare, New Orleans, Trenton, Las Vegas, Phoenix, Los Angeles and Orlando. 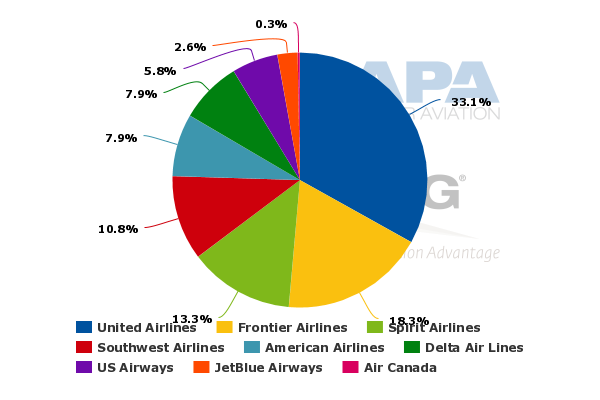 Schedules also show that Frontier is making several cuts from Washington Dulles in Oct-2015 including Chicago O’Hare, Cincinnati, Detroit, Las Vegas, Memphis, Miami and Minneapolis. Again, it is not clear if those cuts are seasonal in nature, but if Frontier opts not to resume that service, the only remaining flights it has from Dulles are Atlanta and Orlando after a short lived expansion that began in Aug-2015. Frontier's only uncontested route out of the markets being cut in Memphis. United is Frontier’s competitor on flights from Dulles to Chicago, Cincinnati, Detroit and Las Vegas. Delta also operates from Dulles to its hubs in Detroit and Minneapolis, and Frontier competes with American on service to Miami. Both Frontier and Spirit have opted to build up a presence in Cleveland after United opted to significantly downsize its hub at the airport in 2014. 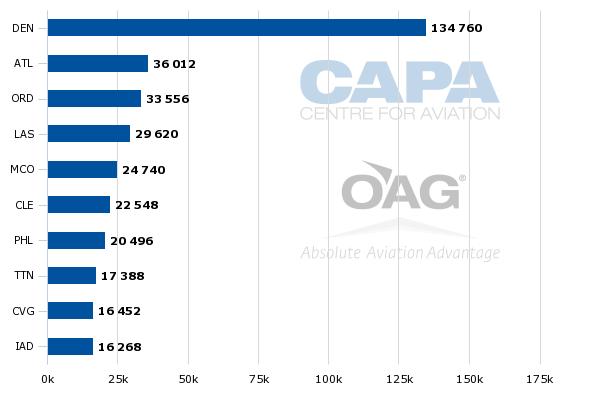 Data from CAPA and OAG show that for the week of 29-Jun-2015 to 5-Jul-2015 Frontier and Spirit represent 11% and 9% of Cleveland’s seats deployed. On an ASM basis, Cleveland Hopkins International Airport capacity Frontier holds a 18% share and Spirit a 13% share. Spirit’s other routes from Cleveland include Boston, Myrtle Beach, Fort Lauderdale, Dallas/Fort Worth and Los Angeles. At the time Spirit announced its service from Cleveland, Frontier was operating flights to Fort Lauderdale and Dallas/Fort Worth, but those markets are no longer listed as Frontier destinations. Those are Spirit’s top bases, so perhaps Frontier opted to focus its attention elsewhere. The three route overlap between the two airlines seems fairly minimal, and perhaps is an indication that there is room for two ULCCs in some markets. Frontier has also built up its presence in Cincinnati over the last couple of years, a market that has been drastically downsized by Delta. It is now the second largest airline behind Delta at the airport, representing 12% of its seats and 15% of the ASMs deployed. It serves a decent mix of leisure and business markets from Cincinnati including Atlanta, Cancun, Denver, Las Vegas, Dulles, Punta Cana, Fort Lauderdale, Orlando, Fort Myers, DFW and Las Vegas. Cincinnati has historically been one of the highest fare markets tracked by US DoT sampling data, and during 4Q2014 (the latest data available) it was the third highest fare market with an average fare of USD82. That data snapshot would indicate that stimulative opportunities remain in Cincinnati. However, Cincinnati was also ranked fifth among airports with the largest decreases of average fares year-on-year with a 5.7% drop. Cleveland was the top airport with a 10.7% fall in average fares, driven in part by the expanded presence of Frontier and Spirit. The airport’s fares at USD413 still remained above the 4Q2014 average, which was USD385. Although Denver remains Frontier’s headquarters and largest base measured by both seats and ASMs, in late 2014 it opted to resize its operations at the airport. It cut roughly 20 mostly smaller routes, concluding it needed to reduce its exposure to higher costs, lower revenue yielding connecting passengers. The airline also stated that Denver’s higher operating costs versus other airports made some routes unviable. Mr Biffle while attending a Routes conference was quoted by The Denver Business Journal explaining that fares in Denver were lower than average, so concentrating a high level of service in a lower fare city would create challenges in earning profits. DoT data show that Denver’s average fare in 4Q2014 USD336, below the overall domestic average of USD385. Although Frontier still represents just a fraction of US traffic, its moves are important to monitor now that it is working to solidify its stature as the second ULCC in the US. Allegiant, whose unit cost are also at the ULCC benchmark, has a much different service profile. Frontier seems to be making network moves where it can play to its position of strength. But it has ambitious growth plans, which make meeting and sustaining cost targets crucial. 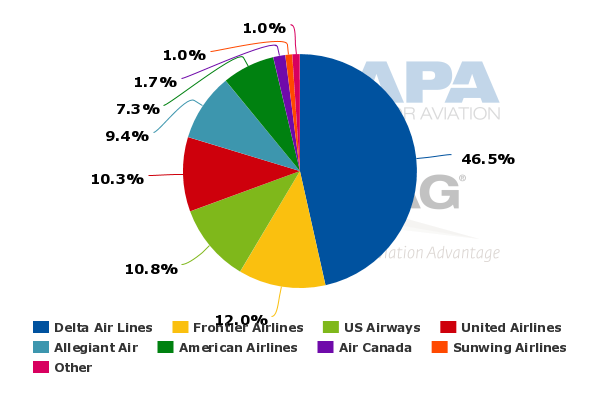 It also faces large US network airlines that in a low fuel environment seem unafraid to match ULCC fares on the one-to-two routes they operate in legacy fortress hubs. It seems as if Frontier faces a slightly different set of dynamics than when Spirit forged the ULCC path. But none of the challenges are insurmountable. As with any change of business model, execution is key.